A battle rifle is an auto-loading infantry rifle that fires an full-power cartridge (a cartridge suitable for hunting medium-large game). The first successful battle rifles were developed during World War II, where rate-of-fire trumped the long-range precision of World War I bolt-actions. This era saw the rise of one of the most iconic guns ever made in America, the M1 Garand, whose semi-automatic firepower ran roughshod over enemies equipped with bolt-action rifles. Today, opinions vary as to whether the battle rifle or the assault rifle is the "best" platform. Most modern militaries issue assault rifles, as countless battlefield analyses following World War II showed that the single most important factor determining who won and lost was, quite simply, number of rounds fired. However, debate over the value of the "stopping power" offered by full-power battle rifles, compared to the ammunition capacity of troops with assault rifles, continues to this day. A bag limit is a limit on the number of animals that may be legally killed during a hunting season or session. A barrel is a metal tube which directs the projectile (usually a bullet) and allows the ignited propellant to build up pressure behind the projectile, driving it out of the barrel. Barrel condition and fitment has a huge impact on accuracy, as a damaged or improperly sized barrel will greatly reduce accuracy. Most pistol and rifle barrels are rifled, while most shotgun barrels are smoothbore, although exceptions exist on both sides. This term requires a great deal of explanation. Please refer to the topic page on barrel harmonics. bbl is an abbreviation for barrel. The term comes from the petroleum industry and means "blue barrel", but over time bbl has come to describe any barrel. The term has leaked into the firearms industry but there is no specific reason why the addition "b" still exists, so some shooters use "bbl" to indicate "blued barrel" or "bull barrel". However, there is no agreed-upon definition. A bolt carrier group is an assembly of parts that is present in many gas-operated firearms, transferring energy from the combustion gases to the firearm action (specifically the bolt) in a safe and predictable manner. The concept of a BCG is most familiar to American shooters through the BCG of the AR-15 series of weapons. BDC is an acronym for bullet drop compensator. A BDC is type of reticle used in dot sights and telescopic sights to help the shooter adjust their aim to compensate for bullet drop (due to gravity) at long range. 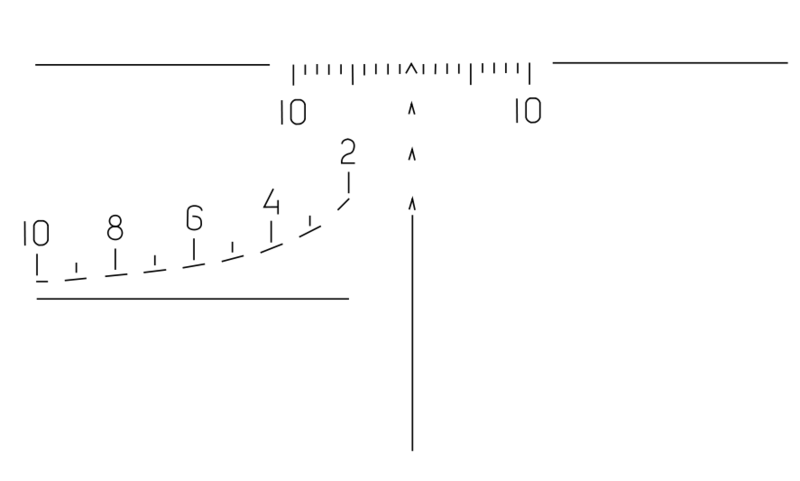 A BDC has several aiming points below the crosshairs that are calibrated to correspond to bullet drop at various ranges for a particular caliber (barrel length and bullet weight are also sometimes taken into account). 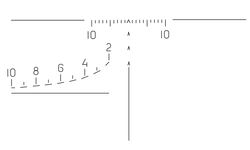 For example, a BDC calibrated for 5.56x45mm NATO may have aiming points for 200m, 300m, 400m, and so forth. To take a 400m shot, a shooter with a BDC does not need to adjust the sight, instead, the shooter simply aims with the aiming point marked for 400m. Sights with BDCs often incorporate some sort of rangefinder to help the shooter determine the appropriate range. Although BDCs allow fast and accurate long-range engagement, they are specific to a particular caliber. A sight with a BDC designed for 7.62x39mm will not be accurate on a 7.62 NATO rifle, so BDCs are most often seen in military use, where calibers and firearms are standardized. Benchrest shooting refers to a shooting style composed entirely of supported, carefully-aimed shots. Benchrest shooting involves a sitting shooter resting their firearm on a table or bench in front of them, and supporting the weapon with either a bipod or a set of soft, sand-filled bags (shooting bags). The weapon is supported in such a way that if the shooter stands up and releases their grip, the firearm will not shift. Many shooters will actually fire the firearm in this manner during competitions, this is known as shooting "free recoil," with the goal being to remove as much shooter-induced error as possible. Benchrest shooting is also commonly used outside of competitions to "benchmark" a firearm, or get an idea of the gun's maximum potential. It is also used to zero a firearm's sighting system. A shooter firing off a bench. BelOMO is an acronym for Belorusskoe Optiko-Mechanichesckoye Obyedinenie (Belarus Optical & Mechanical Enterprise). BelOMO is a Belarussian conglomerate that is known in the USA for producing a variety of firearm optics and cameras. BelOMO-made POSP and PK-series sights are used by Russian military and law enforcement, though exactly which models have been chosen for service over the years is a matter of debate in the USA. BelOMO sights receive mixed reviews in the United States, with some citing excellent glass quality and overall fit and finish, while others claim BelOMO products are sub-par compared to Western or Asian optics at similar price points. BelOMO products have also had difficulty finding acceptance with American shooters due to their AK and SVD side-mount designs, but Picatinny-compatible versions are popping up more and more frequently. Additionally, it is generally agreed that BelOMO sights are unusually sturdy and robust for their price point. A Berdan primer is a primer with two flash holes that ignites when the firing pin crushes it against a protrusion in the bottom of the case called the anvil. To remove a spent Berdan primer, the primer must be levered out of the primer pocket using specialized tools. Because of this, Berdan-primed cases are often classed as "nonreloadable" in the USA. Berdan primers are less expensive than Boxer primers because the anvil is a part of the case, not the primer itself, but they are much more difficult to reload in a home workshop setting. Because of this, Berdan primers are often used in cartridges that are not intended to be reloaded, such as steel and aluminum-cased ammunition. The "big five" refers to the five most dangerous African game animals. These animals are honored not for their size, but for the danger, difficulty, and expense involved in hunting them. The big five are: lions, African elephants, Cape buffalo, leopards, and rhinoceroses. Mixed steel and lead birdshot. Birdshot is a term for shotgun shells that fire clusters of very small shot pellets, used for the shooting of waterfowl or clay pigeons. The term can also refer to the shot by itself. Birdshot is preferred over buckshot for these activities because the many small shot pellets provide a much denser pattern than buckshot; a birdshot shell may contain hundreds of shot pellets whereas a buckshot shell usually contains only six to twelve individual shot pellets. Additionally, birdshot is likely to enter and exit a bird relatively cleanly, whereas the sheer size of buckshot may cause excessive wounds that make meat retrieval difficult. The defining feature of birdshot is that the pellets are small enough to be poured into the shell directly, whereas buckshot must be carefully placed and packed. Although a sophisticated system of birdshot tables and measures exists, the average shooter only needs to know that birdshot is usually measured by shot number. The higher the number, the smaller the pellets, so a box of #9 shot will have much smaller shot pellets than a box of #3 shot. Still, black powder was the most devastating weapon in the world from its invention in ancient China to its eventual replacement by smokeless powder in the mid-1800s. It is still used today in fireworks, hunting, and historical re-enactments. Black powder can be easily made using its three primary ingredients: sulfur, charcoal, and a nitrate. However, black powder is extremely volatile and all manufacture is highly regulated. "Bluing" can refer to several processes, all of which are applied to steel and produce a dark blue or blue/black finish that provides very basic rust and abrasion resistance. Bluing was originally developed as a passivation (rust-prevention) technique but has long since been supplanted in that role by more modern and effective processes. However, bluing remains a popular finish in commercial firearms due to its attractive appearance, low production costs, and adequate protective properties. Note that bluing must be combined with a protective oil to provide long-term rust protection. A bolt is a reciprocating assembly common to just about all repeating firearms. The bolt usually houses the extractor, ejector, locking lugs, and firing pin or striker. When a firearm is cocked, the bolt is pulled to the rear and the magazine pushes a fresh cartridge into the breech. When the bolt moves forward, it pushes the cartridge in the breech along ahead of it, forcing the cartridge into the chamber. Once the firing pin has fired the cartridge, the bolt is pulled backward once again, and the extractor pulls the case back into the breech along with it. From there, the ejector flings the case free of the firearm, the magazine pushes a new cartridge into the breech, and the process begins again. The interior of a gun barrel is called the bore. Shotguns generally have smooth bores and rifles and pistols generally have rifled bores, but exceptions to the rule exist on both sides. The condition and fitment of the bore has a huge impact on a weapon's accuracy, as a corroded or poorly machined bore will not allow the bullet to travel down the barrel on a even and predictable path, resulting in poor shot-to-shot consistency. Boresighting refers to the procedure by which the center axis of a barrel is aligned with the reticle of the firearm's telescopic or dot sight, and a boresight is a device used to assist with this procedure. Most bolt-action firearms can be bore-sighted by eye, see this tech article for a procedure. All other firearm types usually require a boresighting device, as a clear line-of-sight cannot be established from chamber to target. Boresighting devices are usually a specialized laser, and two types exist. The first type of boresighter is a laser light with a "tail" that fits into the muzzle of the barrel. The tail has removable O-rings or a magnet to allow the boresight to fit snugly into various caliber barrels. The second type of boresight is a laser light inside a housing machined to match the dimensions of a particular cartridge. This type of boresight is chambered as though it were a round of ammunition, and the laser projects out of the barrel to mimic the path of a bullet. Bore-sighting, whether by eye or by laser, is meant to expedite the zeroing process, not replace it. 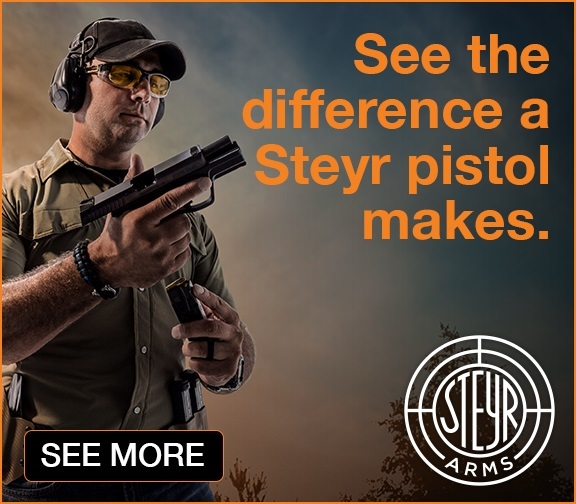 A bore-sighted firearm should still be tested with live ammunition to ensure that the point-of-aim and point-of-impact are the same, however, boresighting can greatly expedite this process and reduce the cost of ammunition required to obtain a proper zero. A Boxer primer is a primer with a single flash hole that ignites when the firing pin crushes the rear of the primer against a semi-fixed "anvil" incorporated into the body of the primer itself. To remove a spent Boxer primer, a punch is inserted into the open case mouth and the primer is punched out of the primer pocket. Boxer primers are more expensive that Berdan primers because they incorporate the anvil into the primer itself, but they are preferred by handloaders and reloaders due to the ease of primer removal. 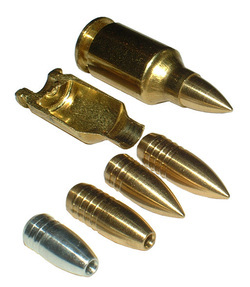 Most ammunition manufacturers that use brass cases for their ammunition use Boxer primers in order to appeal to consumers interested in handloading and reloading. The breech is the space directly behind the chamber, where a cartridge rests before being fed into the chamber or ejected from the firearm. This term requires a great deal of explanation. Please refer to the topic page on Bubba. Buckshot is a term for shotgun shells that are loaded with a small number of large shot pellets. 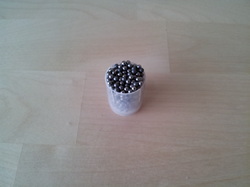 Buckshot is intended for hunting and combat, with each shot pellet having penetration comparable to a handgun round. The defining feature of buckshot is that the pellets are large enough that they must be carefully placed and packed into the shell, whereas birdshot can be simply poured into the shell. Although a sophisticated system of buckshot tables and measures exists, the average shooter only needs to know that buckshot is usually measured by 0 number, pronounced "aught". More 0s indicate smaller pellets, so 000 buckshot will have more, smaller pellets than 0 buckshot. 00 buckshot (double-aught) is the most common load. Buffer is a loose powder that is packed into high-quality buckshot. The buffer material prevents contact between the individual shot pellets as they bounce down the barrel, keeping each shot pellet as perfectly spherical as possible in order to provide maximum accuracy. Shells with buffer material often incorporate some sort of specialized wad to further tighten the shotgun's long-range groups. A recoil buffer is a plastic or rubber plate that is inserted behind the bolt of a firearm. The recoil buffer acts as a cushion on the back of the bolt or bolt carrier, reducing felt recoil and sometimes extending the life of the firearm action. 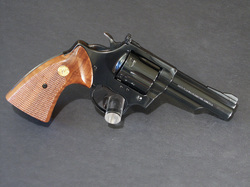 Some firearms incorporate a buffer and some do not; opinions are mixed regarding the usefulness and effectiveness of adding a recoil buffer to a firearm that was not intended to use one. 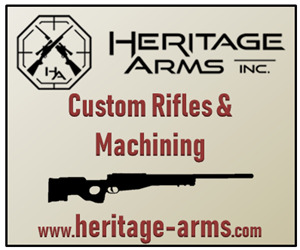 Back-up iron sights are folding sights that are not intended to be the primary aiming system of a rifle or pistol. BUIS are installed on firearms that use a scope or dot sight to provide an emergency sighting system in the event that the primary sight fails. BUIS are hinged so that they can be folded down when not in use, providing the primary sighting system with a full field of view. AR-pattern rifle with folding BUIS. A bull barrel is barrel that does not taper from chamber to muzzle, or tapers very little. Bull barrels are very heavy, but provide excellent rigidity and accuracy. Various bullet types below assembled and cutaway cartridges. A bullet is the projectile fired from the gun's barrel. Although the term "bullet" is commonly used to refer to the entire cartridge, as in "I have a box of 50 bullets", the actual definition refers solely to the projectile itself. Bullet quality is one of the most important factors affecting accuracy, as inexpensive bullets will have varying weights, densities, and contours, while high-quality bullets with tight quality control during manufacture will all be produced (and shoot) nearly identically. A bullpup AUG (left) and a traditional AR-pattern rifle (right). Note that the AUG's magazine is located behind the grip, as is typical of most bullpups. A bullpup firearm is a long gun that has the firing mechanism located behind the trigger, replacing the stock and thus making the overall firearm much shorter. Bullpup firearms are the standard infantry rifle of many nations, including Britain, France, and Israel, but they are not universally accepted. Critics of bullpup designs note that the weapons may feel less balanced, or require the shooter to expose more of their torso when firing from cover. Trigger feel is also an issue, with many bullpups having "numb" triggers due to the linkage required to connect the trigger to the FCG. However, most of these complaints against bullpups come from older designs, or questionably designed "kits" that allow a standard long gun to be quickly converted into a bullpup. Modern bullpups such as the P90 and the TAR-21 are regarded as accurate, intuitive, and highly compact weapons, and their use is widespread in military and police forces around the world. Bump firing is a method of simulating fully-automatic fire. 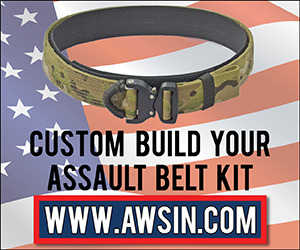 By cradling a semi-automatic firearm in a specific manner, the recoil generated by shooting will "bump" the gun back and forth on the shooter's trigger finger, repeatedly firing the weapon. However, it is almost impossible to aim a weapon held in this manner, so bump firing is purely for entertainment and serves no practical combat purpose. There are also stocks available that incorporate a system of springs and shocks to create a bump-firing motion, without requiring the unusual "cradling" technique. These stocks are expensive but they are currently 100% legal in most states, as they do not modify the gun's trigger mechanism and they maintain the "one shot per trigger pull" requirement for semi-automatic weapons.